Am I alone in my aversion to “alright”? 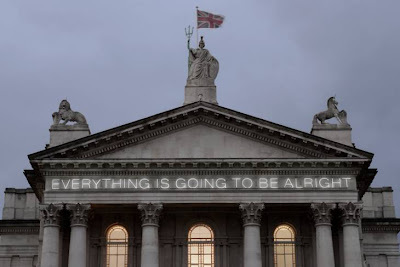 A neon sign above the Millbank entrance to Tate Britain is currently assuring us that “everything is going to be alright”. To me, the sentence provokes an instinctive shudder – how can everything be all right, when it is spelled “alright”*? But I worry that this is fast becoming a minority view, an eccentricity - although the Telegraph, Times and Guardian all back me up, at least in their official style guides (the Telegraph's describes "alright" as an "abomination"). I responded with equanimity to the use of “alright” by East 17, Supergrass and, more recently, Lily Allen – pop stars are allowed some leeway in matters of spelling and grammar. Aaron Britt, in the New York Times, wrote an eloquent and persuasive article not just defending but celebrating the use of “alright” in pop, arguing that it means “something different from the "satisfactory, average or mediocre" that all right conveys…what... countless…pop musicians mean is "sublime, fantastic, second to none." Alright is better than just all right; it's the best, the greatest, the tops”. But increasingly, “alright” is being used as a standard spelling, even by those who make no pretence to youth or trendiness. The Financial Times, the Wall Street Journal, a poster advertising social work. Even the OED admits “alright” into its pages without comment, tracing it back to the nineteenth century (when it first appeared in the Durham University Journal) and describing it as a “frequent spelling of all right”. The only glint of censure comes in one of its citations – from HW Fowler, who in Modern English Usage declared that “there are no such forms as all-right, allright, or alright, though even the last, if seldom allowed by the compositors to appear in print, is often seen…in MS”. I take comfort from this, although I recognise that clinging to the recommendations of a 1926 usage guide is slightly pathetic. Dogberry thinks that there is a distinction between “all right”, as an adjective meaning “satisfactory”, and “alright”, as a phrase used to express agreement or acquiescence, or as a conservational marker to signify a change of topic or the beginning of a talk or discussion. I can see where he’s coming from – for some reason, “Alright class, here’s your assignment” (Wall Street Journal, 5 February 2010) is marginally less jarring than “Well, that’s alright then” (Financial Times, 14 December 2009). The very fact that the word can be found in serious newspapers like the FT and WSJ is a sign that it has successfully insinuated itself into standard English – although, gratifyingly, “all right” is still used ten times more frequently in British newspapers than “alright”. * Apparently – according to Sandi Toksvig, writing in the Sunday Telegraph’s Seven magazine – the sentence is supposed to make you feel depressed, although not because of its spelling. Rather it is designed to evoke 'the ways in which the opposite is the case' – i.e. remind you of all the reasons why things will not be all right. Or alright. - Mr Robert Marley managed to spell all right correctly. I expect "Because every little thing is going to be all right" didn't fit the tune quite as snugly. Cape Alright is somewhere in Quebec. It was until recently governed through a system of landlordism, where the heirs of Isaac Coffin get to grind out profit from the fishermen and seal hunters. "Alright Island is owned by an absentee landlord, who grinds his people to the earth with the hard terms he makes for his land. The island is now for sale and new interest has been aroused in it"
There's more to the difference than just spelling. "All right" and "alright" have different stress patterns and of course different meanings. Goofy, I'm interested to know how you distinguish between them. To me, alright is just a variant spelling of "all right" (which itself can be used in a variety of ways). But Dogberry thinks that there is a distinction in meaning. "All right" has main stress on both elements. "Alright" has main stress on the second syllable, and secondary stress on the first syllable. I'd agree with Dogberry's distinction in meaning. I also think there's a difference in meaning between "the kids are all right" (all of them are doing OK) and "the kids are alright" (they're cool) altho your mileage may vary.